On Thursday November 3rd at dawn, 8 military jeeps with around 25 soldiers and one bulldozer arrived at Um Alfagara. The bulldozer immediately began to demolish six pylons built for bringing electrical wires from the nearby village of Attwani to Um Alfagara. 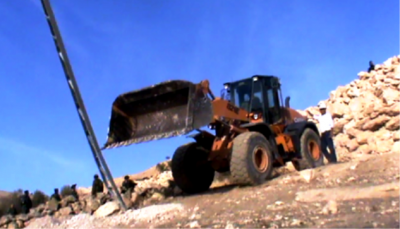 The bulldozer worked a couple of hours, guarded by the Israeli Occupation Forces until the six pylons were torn down and destroyed. Um Alfagara is a small village with 150 inhabitants in the South Hebron Hills on the edge to the Jordanian dessert and beside a large area declared to be a permanent closed military area used as a shooting practice range by the Occupation Forces. There is no access to water except from the wells belonging to the villagers and no electricity except from the electricity provided by a small windmill producing just about enough for the villagers to charge their phones. A new project for bringing electricity is the latest attempt to ease the life for the villagers who mainly stand the poor conditions in their village in order to protect their land against land grab both from the Israeli Occupation Forces and from the settlers in the neighboring settlement Ma’on. The project received the second demolish order on the electric poles around one month ago. The Israeli Civil Administration is planning to expel Bedouin communities living in Area C as soon as January 2012, claiming that the Bedouins do not have rights to the land on which they live and that all Bedouin construction has been done without permits. Demolition orders have been issued against most Bedouin structures. Um Alfagara lies in Area C, under full Israeli military and civil control. Attwani the neighboring village, inhabited by around 300 Palestinians, managed last year in the month of Ramadan to implement electricity and running water. The water is brought in by the neighboring settlement and was finally approved by the District Coordination Office after some months, but the electricity pylons have been destroyed several times. Two pylons on each side of Road 316 have been destroyed many times, but since the villagers of Attwani rebuild the electric pylons every time, it seems that for a while the Occupation Forces stopped harassing the villagers and destroying their pylons until recently. The electricity villagers seek is not only useful for getting light in night but also for charging phones and cameras that are essential for documenting the violation by settlers and the Occupation Forces. Though attacks by settlers have eased a bit, there is still a high risk factor of settler violence in the area of Um Alfagara and Attwani. The settlers from the outpost Havat Ma’on have a long history of violence. The last severe attack was June 2011. Aida Gerard is an activist with International Solidarity Movement (name changed).